Murder Isn’t Always Premeditated…Sometimes It’s Improvised. 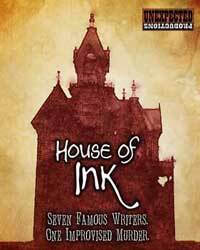 Famous Writers Collide in Murder-Mystery Improv Parody House of Ink. Seven literary giants assemble for a writing retreat only to have one of them turn up dead in House of Ink, an improvised spoof of locked-room whodunits from Unexpected Productions. Imagine Dr. Seuss, Maya Angelou, Carl Sagan, and Stan Lee trapped in an Agatha Christie plot in which you help solve the crime. It’s totally improvised and totally hilarious, with each show a unique mystery. Even the authors change from night to night. Great improv comedy! The cast was really sharp and witty – they carried this theme wonderfully. Thanks for crafting a fabulous date night for people who read! The show was unique and delightfully funny!! The performance itself was amazing! The actors were spot on. Even if you were unfamiliar with any writers body of work, they took care in making sure the experience was just as funny and entertaining as if you had… no one felt left out.